Recold is a SPX Cooling Technology brand, along with other trusted name brands that the customers may already be familiar with, such as Marley, Balcke, and Ceramic among others. SPX designs, manufactures, sells and services all of these brands, which have become part of the global SPX Cooling Technologies family. Recold, Balcke and Marley represent the best-of-breed in wet and dry cooling, cooling towers and air-cooled heat exchangers, and parts. Recold offers a complete line of fluid coolers and evaporative condensers that will satisfy your need, whatever it is. All units are completely factory assembled and tested to ensure a quick and easy installation with no startup problems. The Recold JW is a low noise, forced draft, centrifugal fan design with a weight saving, corrosion free copper coil all in a low height configuration. The Recold MW is an induced draft, axial fan design with a weight saving, corrosion free copper coil all in a low height configuration. 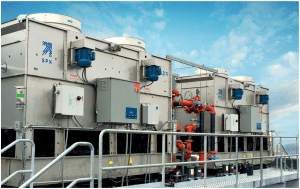 These Evaporative Fluid Coolers are ruggedly built units constructed to provide many years of durable, dependable service with minimal maintenance requirements. The low profile design simplifies integration into architectural designs and can be placed indoors. Quality materials and workmanship are a key factor in meeting this objective. To learn more about this product line and to see details about each fluid cooler model, click here. The Recold JC is a low noise, forced draft, centrifugal fan design with a weight saving, corrosion free copper coil all in a low height configuration. This Evaporative Condenser is a ruggedly built unit constructed to provide many years of durable, dependable service with minimal maintenance requirements. Its low profile design simplifies integration into architectural designs and can be placed indoors. Quality materials and workmanship are a key factor in meeting this objective. . By using the superior characteristics of copper, The JC Evaporative Condenser becomes the most cost-effective solution to commercial freon condensing projects. The Recold MC is an induced draft, axial fan design with a weight saving, corrosion free copper coil all in a low height configuration. This Evaporative Condenser is a ruggedly built unit constructed to provide many years of durable, dependable service with minimal maintenance requirements. Quality materials and workmanship are a key factor in meeting this objective. All units are completely factory assembled and tested to ensure a quick and easy installation with no startup problems. By using the superior characteristics of copper, The MC Evaporative Condenser becomes the most cost-effective solution to commercial freon condensing projects. The Recold LC Evaporative Condenser is an induced-draft counterflow evaporative condenser with patent-pending heat transfer technology. Its unique design reduces refrigerant charge up to 40 percent and lowers fan energy consumption by up to 50 percent compared to conventional evaporative condensers, while offering installation and maintenance advantages. The Recold LC is well-suited for condensing halogenated refrigerants in supermarket refrigeration systems, small refrigerated warehouses and modular HVAC applications. 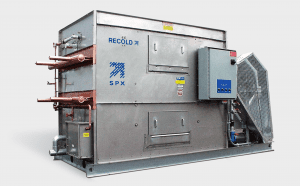 To learn more about this product line and the solutions offered by Recold, click here.